If you are looking for a unique, well designed and practical garden finished to the highest quality, then Read Landscapes is for you. Read Landscapes was established in 2006 by Andrew Read who received a BSc in Garden & Landscape Design from Writtle College. 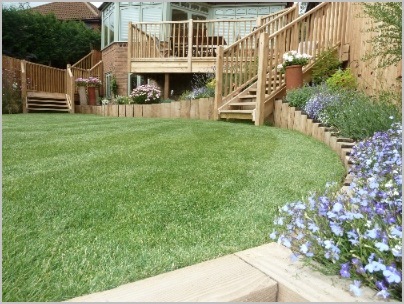 Since then, we have been designing and building gardens and front gardens for clients in and around the South Essex area. Read Landscapes is available for both design and build projects, dependant on your needs. The first stage of the process is always for Andrew to meet and chat with you about your project, to understand whether you have formed ideas about what you require or whether you would like Andrew to come up with some design ideas. We do not charge a fee for this initial consultation or any subsequent meetings. Andrew will talk you through any design charges when he meets with you. One of the benefits of choosing Read Landscapes is that Andrew works on each project himself, overseeing the build to ensure that it is built to plan and to a high level of finish. Having a designer and qualified landscaper on site means that we can be more ambitious with our designs, using curves, differing levels and bespoke features such as sleeper retaining walls, pavilions or pergolas constructed on site. 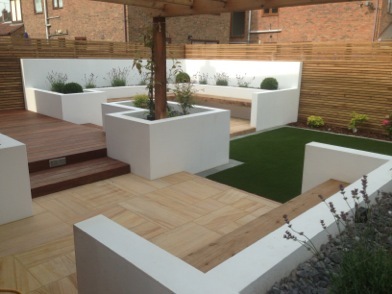 We have experience in creating both modern and traditional gardens and of working on complex sites, particularly sloping gardens. Take a look at our gallery to see examples of our work and feel free to give us a call to talk through your project and find out whether we can help you.